Published in the Dover Express, 1 February, 1980. When the Castle Church fell into ruin, St James’s was used jointly as the parish and the garrison church, and was so continued until after restoration. 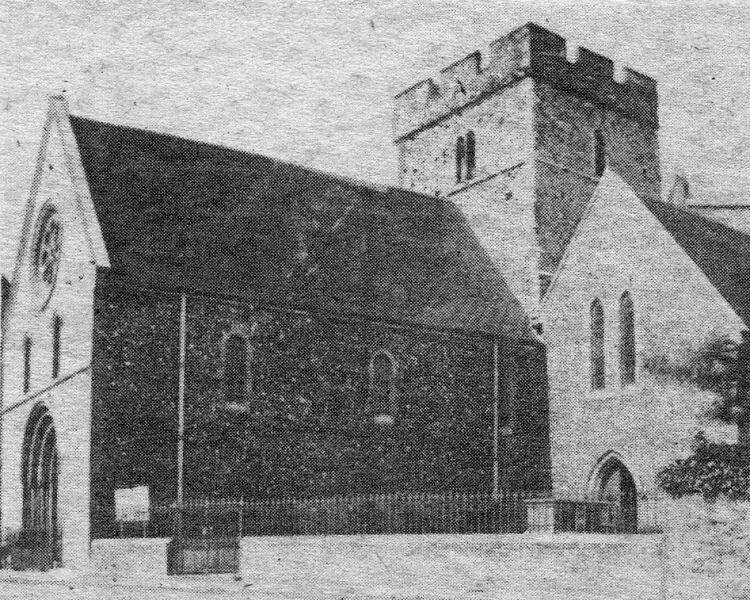 St Mary’s-in-the-Castle was re-opened in 1862 when the communion plate of the Castle Church, which had been at old St James’s Church since 1711, was restored to the Castle Church, The memorials of old Dover families preserved in this church were numerous and interesting. In 1824, £1,200 was raised by loan on the security of the Poor Rate to pay for the cost of extensive repairs to the church. The Vestry considered but rejected a proposition to take down the tower. The work carried out consisted of replacing the roof, which was found to be in a dangerous state, the removal of an arch between the tower and the south wall, and the raising of a gallery and its extension to the south wall, a new vestry room being constructed underneath this gallery. The work took six months, and during this period the congregation made use of St Mary’s church. A resolution, thanking the minister and churchwardens of St Mary’s for accommodation, was passed by St James's Vestry on December 24, 1824. The want of more church accommodation in St James’s parish was felt as early as 1842, the adoption of pew rents at St Mary’s at that period having caused many to go to St James’s. It was proposed then to build a new church, at a cost of £3,000; but, as the subscription list hung fire at £500, the project was postponed for twenty years, and then was carried out on a much larger scale, the old parish church being vacated in 1862. For a time the disused fabric had a neglected appearance—its windows broken, and walls falling into decay. In 1865, the use of it was granted to a small congregation of French Protestants, under the pastorate of M Biguet; but, in 1866, it was again vacated, and a project for its restoration was started. After an expenditure of about £11,000 on the new church, it was rather a tax on the parish so soon to undertake a work of restoration; but a spirit of churchmanship, which could not endure the sight of an ancient sacred edifice going to ruin, was roused, and the year 1869 saw old St James’s church carefully restored by Mr W. J. Adcock, under the architectural direction of Mr Talbot Bury. Eastward of what was Messrs Leney’s Brewery, where the town wall crossed Dolphin Lane, the houses on the north side were comparatively modem, with the exception of the "Dolphin Inn," and that lost the appearance of antiquity by being rebuilt. Dolphin House stood at No. 14, next to Dolphin Place, until 1906, when It was demolished, together with several adjoining cottages, to add new buildings for Messrs Leney's Brewery. Dolphin House had been many things in turn—a private residence and the birthplace of Mr Steriker Finnis, a Volunteer Institute, a Young Women’s Christian Association, and, prior to demolition, a private residence again. After passing the one-time brewery and the malt houses on the south side, one used to be able to see an old wall, evidently constructed out of the ruins of the town wall, enclosing the East Kent Road Car Company’s (formerly the Gas Company’s) premises, and which in earlier days was the boundary of Mr Fector’s property. The land opposite, on the north side, was a part of Mr Gilbee’s estate; and half an acre of it, divided into thirty-one plots, in Dolphin Lane and Russell Street, were sold by auction by Messrs Terson and Son, on the 15th of September, 1837, realising £1,500. The purchaser of the land subsequently sold the Dolphin Lane clots to a builder for £700, and that builder, in carrying out his scheme for erecting twenty-two cottages thereon, landed himself as an insolvent debtor in Dover Castle. At the corner of Dolphin Lane and Russell Street now stands the "Castle’" Inn. This house, under the name of the "White Hart," was there long before Russel Street was made; and, in the olden time, probably the "White Hart" was the last house of call on the outskirts of the warren of the Constable of Dover Castle, then known as Warden Down. "White Hart" up to Golden Cross Cottages, was garden ground, in which were shanty stables, where a Mr Golder kept a stud of donkeys, which the visitors used to hire for riding along the seashore. The only other buildings then actually existing in Dolphin Lane seem to have been two antiquated cottages facing newer buildings in Russell Place, the latter having been completed in 1838, simultaneous with the formation of Russell Street, which was named after Lord John Russell. A considerable portion of Russell Street, more particularly the eastern side of it, was formed on land belonging to the Almshouse Charity, including the site of Russell Street Chapel and the houses in Russell Place. The chapel in Russell Street, built by the Congregationalists, was opened for public worship on the 12th June, 1838, the site having been purchased, at a cost of £370. and presented by Mr Thomas Wilson, of Highbury, London, the cost of the building being £1,700. In 1893, a school hall adjoining was built, at a cost of £2,000, making a total cost of £4,070. When the new Congregational church was built in High Street, the Russell Street Chapel became its Sunday school. 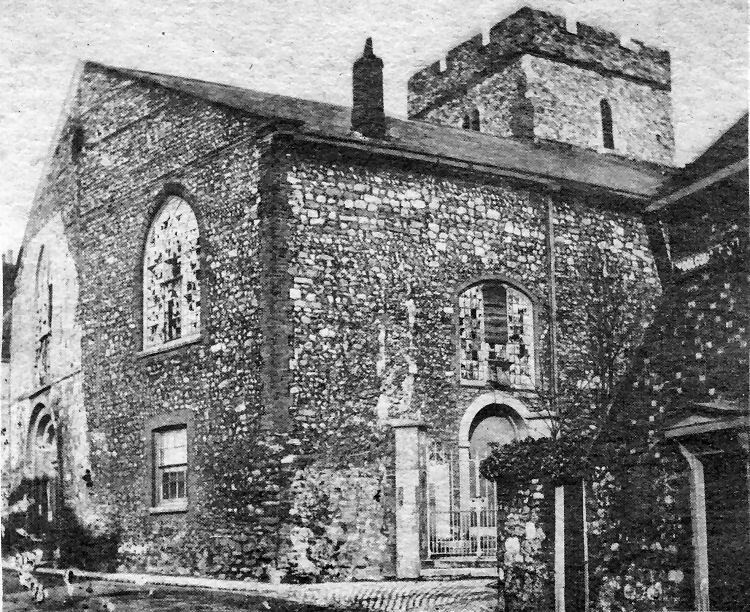 Vandalism was evidently a problem in Dover even when this picture of old St James’s Church was taken, In the early 1860s, at a time when the venerated building had been made temporarily redundant. The vast majority of the small panes of glass in the arched windows were broken and the church was neglected. The drastic change in the appearance of the church after the restoration between 1867 and 1869 can be judged by the picture above, which was taken some years later. The old house on the right of the top photograph stood on the corner of Woolcomber Street and Trevanion Street, the latter running alongside the churchyard towards the gas works, which stood to the rear of Marine Court.